Are you ready to get fancy in Uptown? 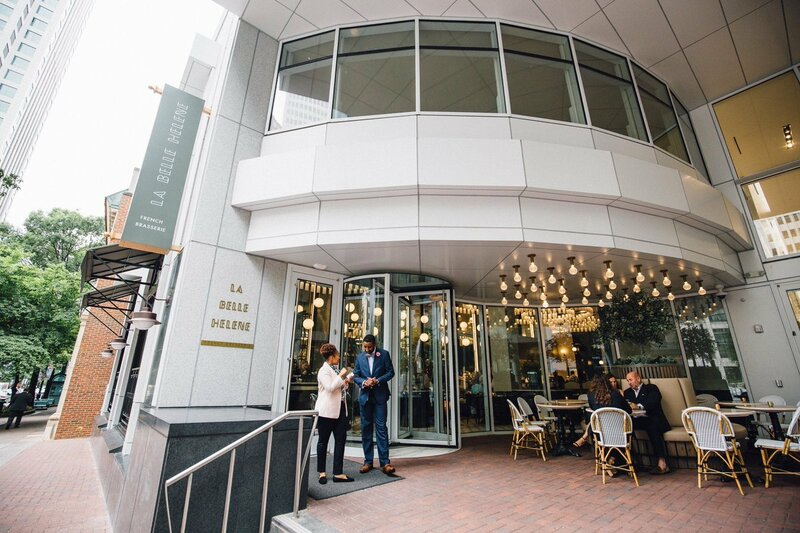 Well then, pull out your berets and let’s head to La Belle Helene at 300 S Tryon St. Just please plan this fancy feeling at least a week or so in advance because everyone is trying to feel fancy these days. La Belle Helene opened on July 31st and has been packed since then. But recently, after booking a week in advance and being completely fine with having dinner at 5 pm on a Friday, I got to experience and understand what all the fuss is about. First, let’s talk what I mean by fancy at La Belle Helene. I am not talking wear your ball gowns and all of the jewels. I am talking sophisticated, sassy. Looking around the space at all the others who found dining at 5 pm totally acceptable, the style was cool. Black leather leggings, sleek sweater dresses, and jeans with heels and silk tops were rocked by the ladies. Men tended to follow one of two looks- the banker just out of the office look (it was 5 pm after all) or the dark jeans, loafers (no socks of course) and blazer look. Put simply, people were looking sharp and adult. The space itself gives off a cool sophistication that Uptown has desperately needed and been striving to perfect. The white marble features are cool against copper, barn wood, and iron accents. There is a bit of a 1920’s vibe, where you would absolutely expect to see Gatsby and Daisy leaning and chatting flirtatiously against the bar. Now, let’s talk about the food. The menu, of course, is French. The charcuterie board is amazing and we also tried the Tarte Flambee and it was delightful. We paired those with a glass of red (from a French vineyard) and the specially-brewed signature beer from Sycamore. For dinner, I ordered the daily special of rotisserie pork and my husband got the beef tartare. Both were savored. The food was so flavorful, it inspired us, normally speed eaters, to take our time, and truly enjoy every bite. The atmosphere also inspired that slow, easy, elegant dining experience. Now, if you are sitting there thinking this is an uppity French restaurant, you are incorrect. Although timeless elegance in its ambiance, La Belle Helene is actually modeled after the French Brasserie, which is an informal restaurant, similar to a brewery. We all know how Charlotteans love breweries. 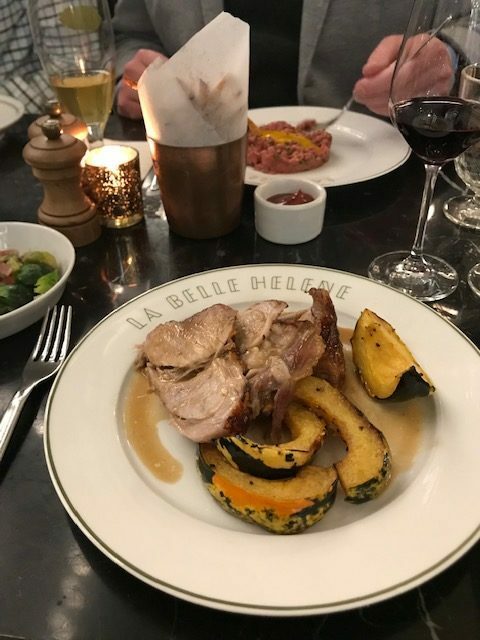 So, if looking for a nice night out, where you want to feel culture and sophisticated, check out La Belle Helene, just make sure you properly plan that fanciness, since lots of people are getting that same vibe.